Our commitment to our SPIRIT Values of Safety, People, Integrity, Responsibility, Innovation and Teamwork extends beyond our own activities. It is essential that our suppliers also remain aligned with those values to ensure operating excellence. 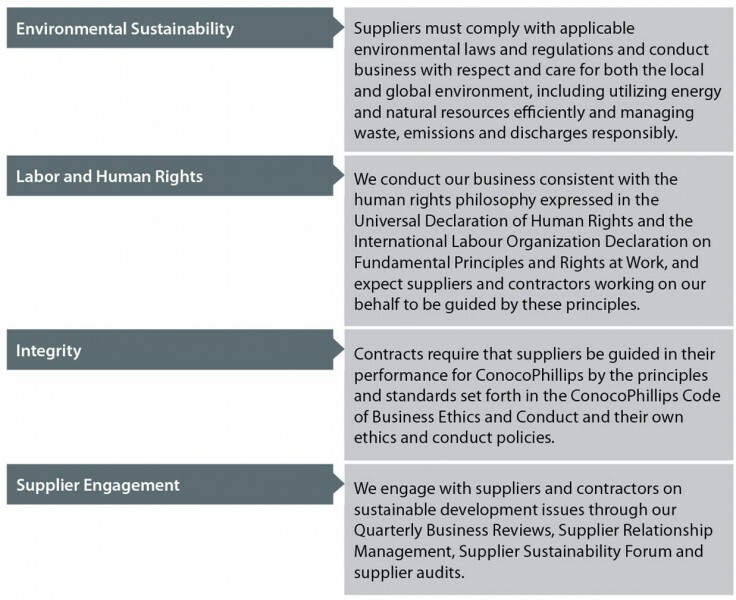 Our contracts require that suppliers be guided in their performance for ConocoPhillips by the principles and standards set forth in the ConocoPhillips Code of Business Ethics and Conduct and their own ethics and conduct policies. We have developed our Supplier Expectations to provide additional clarity to our suppliers regarding our expectations in these areas: integrity; labor and human rights; health, safety, and environment; and supplier inclusion. Including these clear expectations and standards in our contracts means that sustainability considerations are included in total cost of ownership evaluations, quality audits, and our ongoing discussions with suppliers on performance indicators and continuous improvement. We emphasize promoting local and diverse sourcing and supplier capacity-building in our procurement and we expect our suppliers to do the same. We expect to do business with qualified suppliers that share our values, whether minority-owned, women-owned, or small business enterprises, or global, local or indigenous suppliers around the world. We place a high priority on purchasing goods and services locally and are committed to giving local contractors and suppliers the opportunity to participate in projects and operating requirements, generally through a competitive bidding process. We also look for opportunities to develop local suppliers and promote local hiring as appropriate to meet business needs. In the U.S., we do business with diverse companies and continue to give them access to business opportunities through our Supplier Diversity Program. 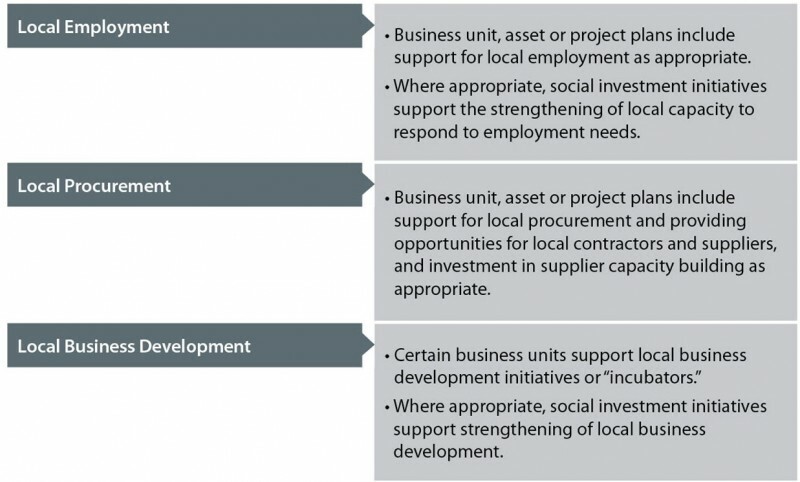 This approach attracts qualified suppliers, stimulates local economic development, and creates long-lasting social and economic benefits in our stakeholder communities. Through our Supplier Diversity program, we actively participate in certifying and developing diverse and small local businesses in the United States. Read more about supplier diversity efforts in our Lower 48 business unit. The supply chain function contributes to the company’s sustainable development commitments by integrating sustainability issues into our processes and procedures. This incorporates sustainability thinking into sourcing, category management, our requisition-to-pay process, contracts, and material management programs. 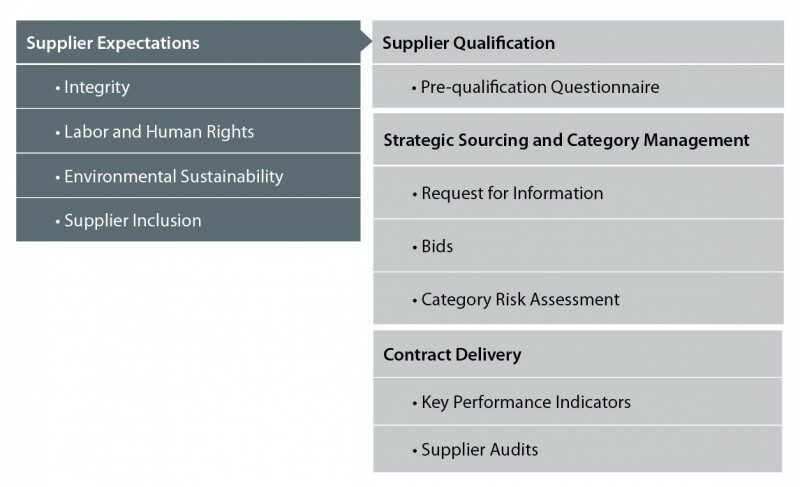 Integrating oversight on labor and human rights into our procurement processes and procedures includes recommended questions for supplier pre-qualification, bids and audits, as well as contract language. The questions and contracts directly address these issues and are based on our commitment to conduct our business consistent with the human rights philosophy expressed in the Universal Declaration of Human Rights and the International Labor Organization Declaration on Fundamental Principles and Rights at Work as described in our Code of Business Ethics and Conduct and our Supplier Expectations. We recognize slavery and human trafficking likely exist in every country. We are committed to the California Transparency in Supply Chains Act of 2010 and the United Kingdom Modern Slavery Act 2015. We integrate sustainable development into our key business activities. Our suppliers play a significant role in our business activities from performing construction to providing well services to supplying equipment; how they manage their impacts on the environment and community is important to us and can impact our performance. Review the ConocoPhillips Sustainable Development strategy and goals and how we can work with suppliers. Identify Sustainable Development opportunities and risks in the extended supply chains of critical categories. Share best practices for building supplier capacity throughout the supply chain. By collaborating with suppliers, we are able to identify activities in their operations and extended supply chains that have environmental and social impacts and guide how they manage those impacts.